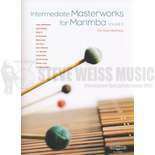 Intermediate Masterworks for Marimba features 24 premiere recordings played by eight marimba virtuosi! During the past few years, marimbist Nancy Zeltsman has spearheaded an initiative to commission, publish and record the 24 new marimba solos included on this remarkable two-disc set—compositions that could be performed by students and virtuosi alike. Zeltsman also wanted to encourage both leading and lesser known composers to participate, so that in addition to the works commissioned specifically for this project, a composition contest was held. 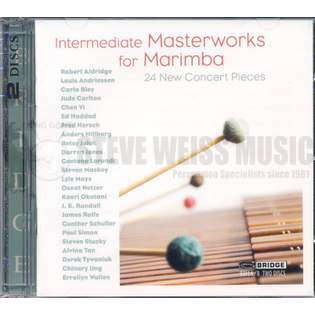 The resulting 24 pieces cut a broad swath across a range of styles and generations, with composers including pop star Paul Simon, Third Stream legend Gunther Schuller, Louis Andriessen, Lyle Mays (pianist with the Pat Metheny Group), and more. 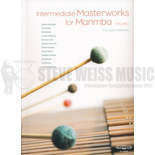 The pieces are published in 2 separate books of 12 pieces each, also available here at Steve Weiss Music.